Being a happy hostess means that you need to enjoy and relax at your own dinner party. To be just that, you need to plan ahead. Setting a date, sending invitations, make-ahead dishes are some of the things on your checklist that you can tick off weeks before the big day. Once you have those out of the way, impressing them with a great menu and tablescape should also be well thought out. 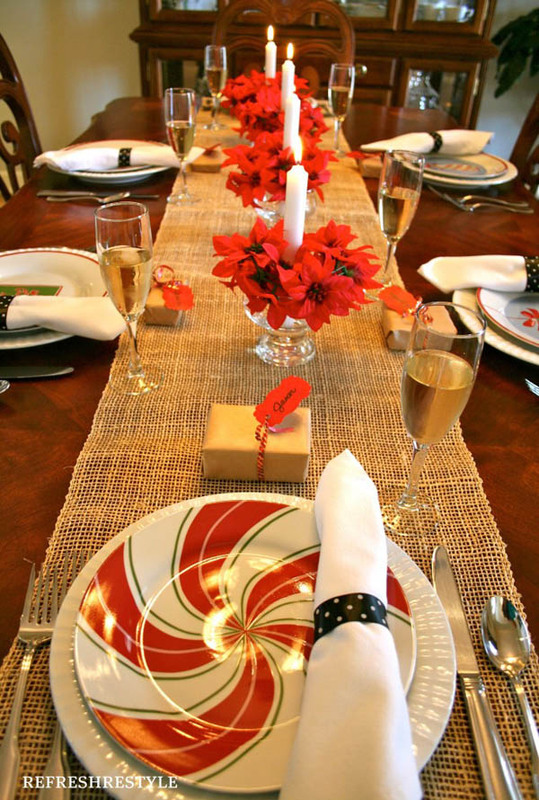 Below are some ideas for a beautiful Christmas tablescape. When you have the whole white Christmas going on at home, make sure that your tablescape goes with the theme. Think Queen of Narnia when arranging the table. So a fur lining the center would be a nice touch. Somehow the fur says, cozy yet royalty at the same time. Fresh poinsettias on top of a burlap table lining complement each other. It is simple yet gives off a warm Christmas energy inside your home. A bucolic setting for a Christmas tablescape can be extremely charming and inviting. Distressed wooden artifact and pine can really put a smile on ones face. As if after having a great hearty dinner, a nice warm cup of hot choco will make the whole evening perfect. Going whimsical brings so much character into the room. Ceiling installation gives you this quirky appeal and it is a great focal point. Plus, you need not over crowd the table with centerpieces. The use of twigs, baubles and snowflakes brings a magical touch to the whole dining area. It also livens your traditional Christmas décor up.